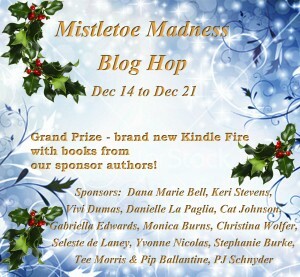 Along with the main prize, each blog included in the Hop is also giving away their own prize. Do you know why we hang mistletoe above our doorways? Well I was curious so i did some internet searching and ran across a post on Smithsonianmag.com. Baldur, grandson of the Norse god Thor, woke up one morning certain that each and every plant and animal on earth wanted to kill him. His mother consoled him. His wife consoled him, but all to no avail. As Baldur cowered in his room, half-wild with fear, his mother and wife decided to ask every living thing to leave their poor Baldur in peace. They begged the kindness of the oak tree, the pig, the cow, the crow, the ant and even the worm. Each agreed. Then, as Baldur paused to celebrate his release from torment, he felt a pain in his chest. He had been stabbed and killed by an arrow made from the wood of a mistletoe plant. Mistletoe was the one species on earth his wife and mother had failed to notice. Baldur died, but a lesson was learned: Never forget about the mistletoe. Mistletoe would come to hang over our doors as a reminder to never forget. We kiss beneath it to remember what Baldur’s wife and mother forgot. At least that is one version of the origin of our relationship with mistletoe. I'm having a contest, and it's pretty simple. Have you ever kissed or been kissed under the mistletoe? 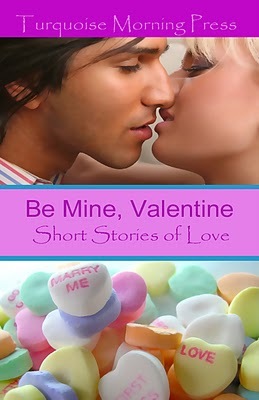 I'd love to hear about it :) Leave a comment on this post, along with your email address so I can contact you, 1 winner...maybe 2, will have their choice .... from any one of the anthologies I have stories in. Don't forget to hop to the rest of the bloggers !! Thanks for stopping and happy hopping !! now as to your question: have I been kissed beneath mistle toe. No. Evidently, all the males I've fallen for have lacked the romantic inclination. Hi Krista, well the first thing I have to say is how beautiful your website is. Gorgeous! Come to think of it, I think my grandparents are the only people I've ever kissed under the mistletoe because I think they're the only ones who ever hung it up! Now that I've read your post, I feel the urgent need to get myself some, hang it up, and kiss the hubby! Wishing you a very happy holiday and blog hop! Well this has been a great thing. It was nice to find out that I'm not the only one that has not been Kiss under the Mistletoe. We should have a Mistletoe party! Happy Holidays to everyone. Never had a kiss under the mistletoe but I think it would be very romantic! Aw that is sad, I never heard that story before. Yes I have been kissed under the mistletoe. I've never been kissed under the mistletoe. Nope, I believe that nature belongs outside alive, not in the house dead. I'm sure the idea is romantic, but not for me. I have an oak tree out front which has tons of mistletoe in it... Not so much this year as it has been really weird with the weather but i kiss my hubby under that tree all the time especially when we are outside raking the lawn or playing with the kids. Yes, but not since I was a teen and I really don't remember it. No I have never been kissed under the mistletoe. No i havent. Great hop & awesome giveaway! Thank you!! Happy holidays to you all! Best wishes and many blessings! Unfortunately I never have....but I keep hoping.